I know it has been a long time since I last posted but I have been a bit busy. I got a new PC a week or so ago and it has taken me some time to get all my programs, files and machines set up. Anyway I think I have got there now and am back to doing a bit of designing. The freebie today is a set of frames with optional mats - hope you like them, I think they could be useful for birthdays and Christmas. Thank you very much for this beautiful frame ! Have a nice week-end. These look so nice; I am excited to put them to use. Your work is great and we so appreciate you sharing. Love the frames. They will be very versatile for cards. I hear your pain about getting a new computer/laptop. I, too, recently got a new laptop. Still trying to get my programs transferred over. These frames are wonderful! Thank you. I moved from a PC (didn't work with my cutting program...) to a MAC recently. It has taken FOREVER to get everything back to normal. I do sympathize with you! 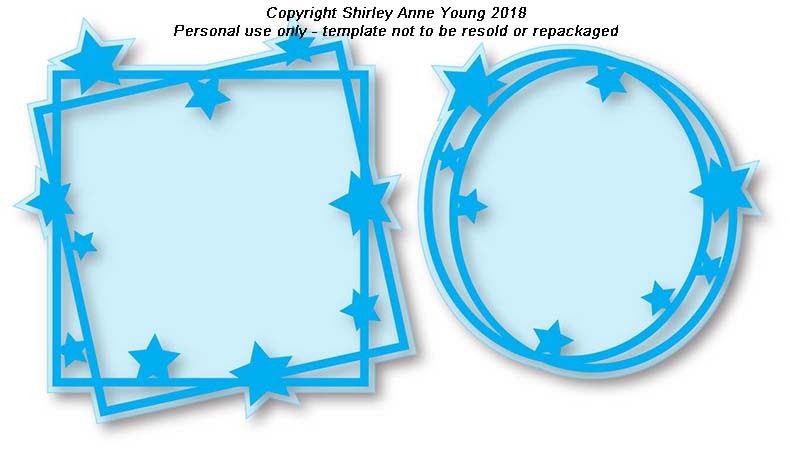 GREAT designs Shirley, love the star theme. Glad to hear your back in order with your 'puter, it's a shaky thing to do LOL. Très jolis cadres étoilés, merci beaucoup pour le partage de vos fichiers ainsi que pour votre travail qui est toujours très apprécié. Thank you once again for a lovely file. Thank you, once again, for a very lovely useful file! Glad to hear your new computer is up and running. Thanks for this very useful file. The frames are very festive looking. Thank you! Thank you Shirley, since my computer died I am slowly restocking some files. Lesson learned - back up files! thanks for the beautiful frames! !